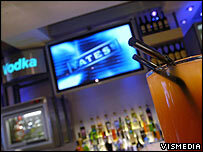 Bar operator Yates Group has recommended a £93m ($171m) buyout offer led by the firm's management. Thorium - a company formed by Yates' management team and private equity firm GI Partners - has offered 140 pence per share for Yates. Yates chairman Mike Hennessy described the offer as an "attractive price". News of the deal came as Yates - which operates the Yates and Ha!Ha! chains - unveiled annual pre-tax profits of £4.1m, down from £9.7m last year. Pre-tax profits before exceptional items were £10.6m, up from £10m last year, while turnover was down 1.2% to £151.3m. Like-for-like sales at the firm's Yates wine bars were down 3.9%, although sales at the refurbished 21st Century Yates were up 1.6%. The Ha!Ha! chain saw like-for-like sales up by 3.2%. "Much has been achieved at Yates in the last three years," said Mr Hennessey. "However, during that same period high streets have become overly populated with bars and night-clubs and the sector is now intensely competitive. "The independent directors therefore believe that the offer represents an attractive price for Yates shareholders."